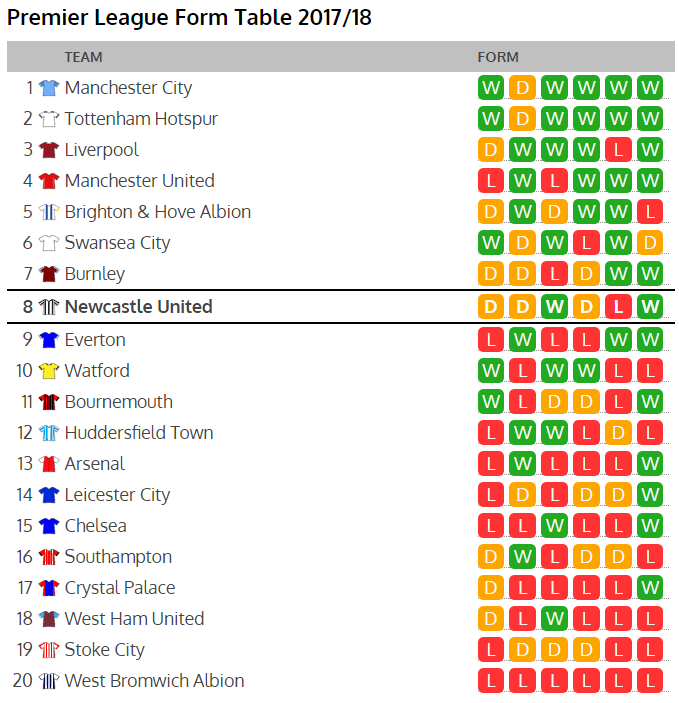 The Premier League form table ahead of Newcastle United taking on Huddersfield. When it comes to recent form, Newcastle have lost only one of their last half dozen matches. Defeat at Anfield but three draws and wins over Man Utd and Southampton giving nine points from six games. Results that put them eighth in this Premier League form table and which if continued over a season, would see Newcastle in a similar position in the full table. The wins for Huddersfield over West Brom and Bournemouth have given Huddersfield a decent chance of survival, having picked up only one other point (draw v Swansea) in 2018. There are a number of other positives in the form table for Newcastle United. Rafa’s team travel to Leicester next weekend and they are in really poor form, without a win in five games, they went a goal down at West Brom last time out but managed to at last get a victory as Pardew’s team collapsed yet again. Interesting as well to see that the bottom five in the Premier League table are also the bottom five in this form table. Between them they have only three victories in their last 30 combined matches, so if that kind of form continues, the number of points needed for survival could be far less than what might have been anticipated.